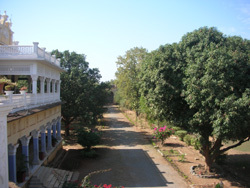 Day 1 - The Guests will arrive from Raipur Air Port by road and transfer to Kawardha Palace. They will enjoy the evening in Royal hospitality and some unique folk Dance. 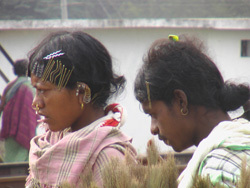 Day 2 - The Guests will visit Tribal villages of the Gonds and Baiga Tibes with picnic lunch. Day 3 - The Guests will visit the enchanting and exotic Bhoramdeo Temple in the morning and can relax at the Palace in the evening. Day 4 - After breakfast our Guests will start for Kanker Palace, Kanker.They could either carry a picnic lunch or stop over for lunch at a Hotel in Raipur. They will be received at Kanker Palace with a traditional welcome. 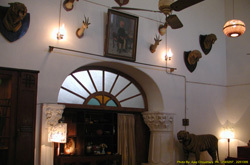 Once refreshed the Guests will be entertained by Chhattisgarhi folk musicians over beverages and Pre-dinner snacks. Members of the Royal Family will join them to share their insights into the life of the region. Day 5 - After breakfast the will be driven up the winding ghats of Keshkal for some spectacular views of the tropical jungle below. 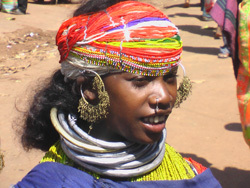 Later will visit the village of the Deer-Horn Muria Tribe and have glimpse of the Gotul System. Here one could enjoy the wonderful village food with some local tardy and be Guests to one of them. After an early lunch, the Guests Later they will get the opportunity to observe and enjoy Tribal life up close when they will visit a Tribal Haat (market). Day 7 - After breakfast the guests will leave for Jagdalpur, the largest town and nerve center of Bastar.Lunch would be packed and can be had in our secret spot in the jungle. Day 8 - Our Guests would start exploring this Tribal Land by visiting the famous Bison-Horn Maria Tribe Known for their weaving, dance and hospitality. later they could visit the rich forest of Kanger Valley National Park and its Attractions (which include the Kailash caves OR gushing cataracts of Tirathgarh). On their way back one could catch a glimpse of a weekly Haat. (depending on the time). Day 9 - On this day the Guests could opt for a remote and unspoilt Tribal Haat Or visit Chitrakote waterfalls, one of the country's largest or Barsur , home to the ruins of the 5th century Nagavansh Temples. Day 10 - The Guests could spend the first half of the day exploring the capital of Bastar, one of India's largest and most exotic erstwhile princely states. A visit to the Anthropological Museum and some craft centers will be the attraction of the day. After Lunch at a hotel one could opt for another Haat. Day 11 - The Guests will leave for Raigada (Orissa). This drive will be along the Eastern Ghats, have some lovely landscape. On arrival they will be checked into a deluxe hotel. Day 12 - Early morning, a drive of about an hour and a half would take them to village called Chhattikona. 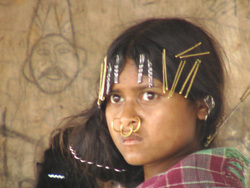 Here is one of India's most remote and un-spoilt markets of the Dongaria Kond Tribe, who sport some most exotic hair dresses and jewellery. The Guests will return back to the hotel for lunch and leave for Jeypore thereafter. 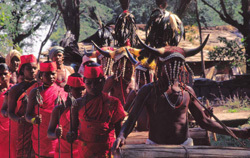 Day 13 - The Guests will continue to drive along the Ghats as they will visit the gay and colourful markets of the primitive Bondo Tribe. They will return for lunch to the hotel and then drive to Vishakapatnam. Day 14 - Leave for the next destination. The programme might be altered to accommodate visits to seasonal or immediate tribal events of interests. 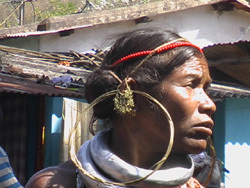 Our policy is to disturb as little as possible the normal daily life of the Tribal People. Powered by : Netgear Solutions.